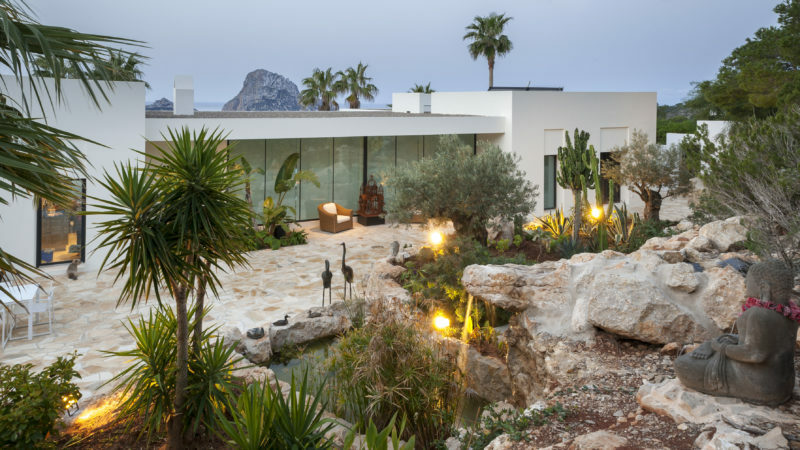 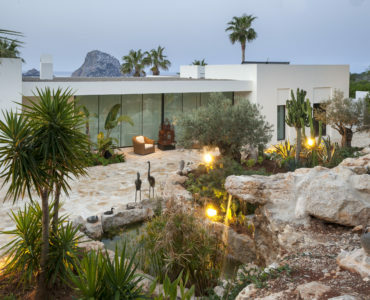 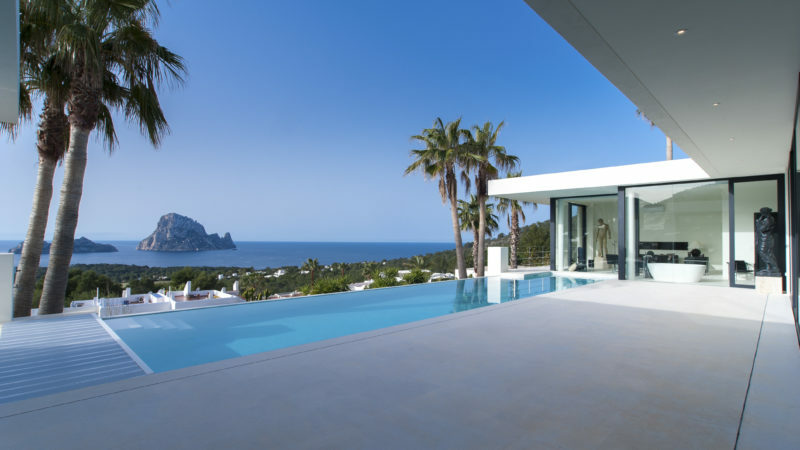 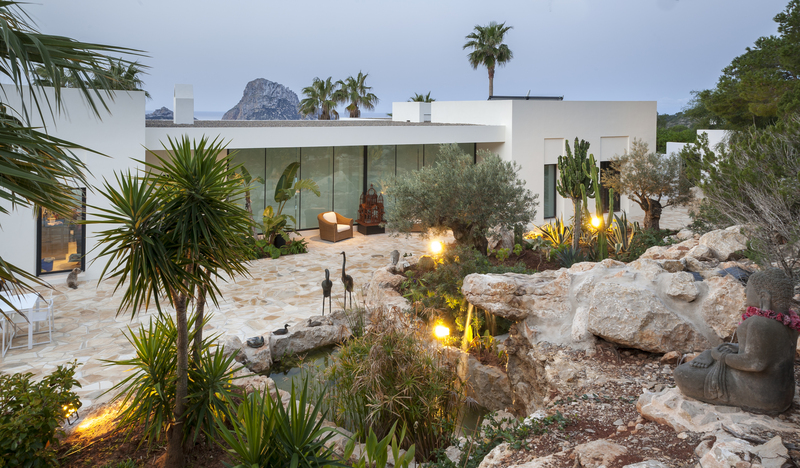 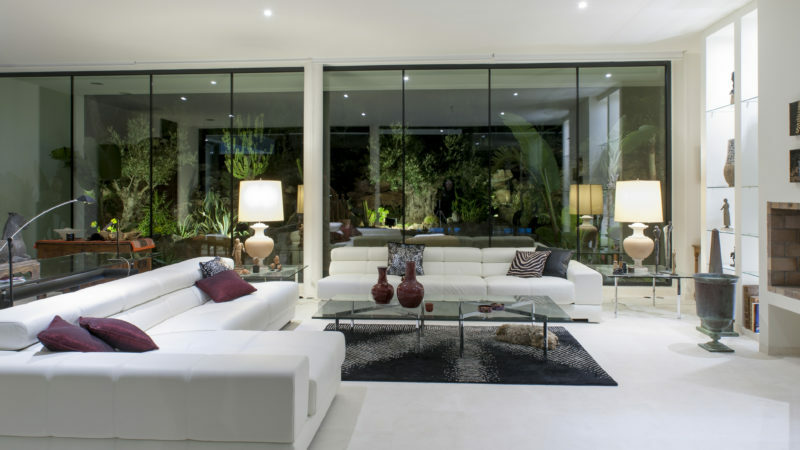 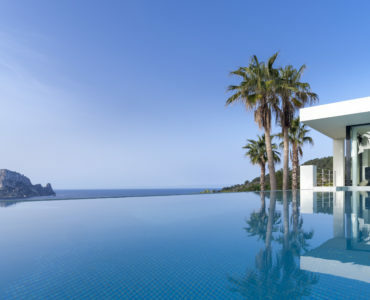 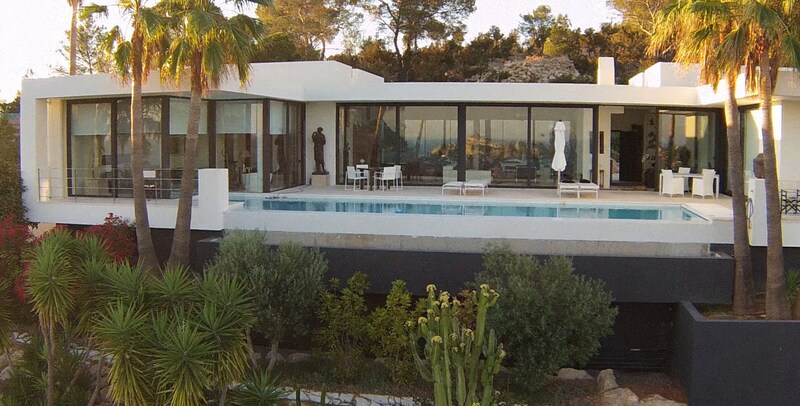 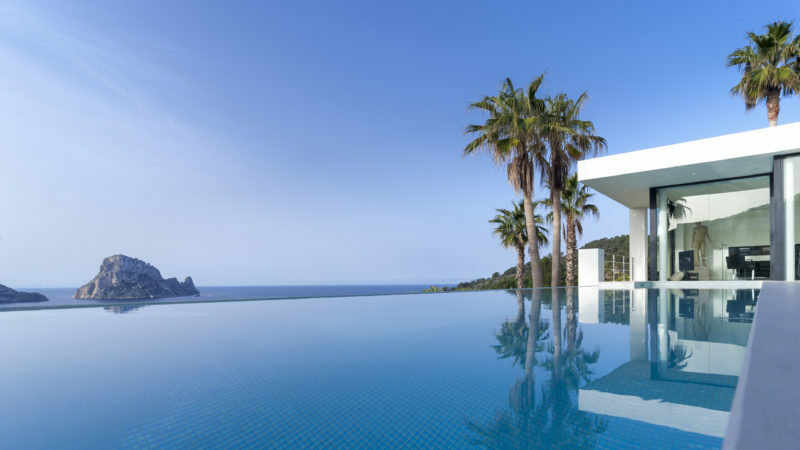 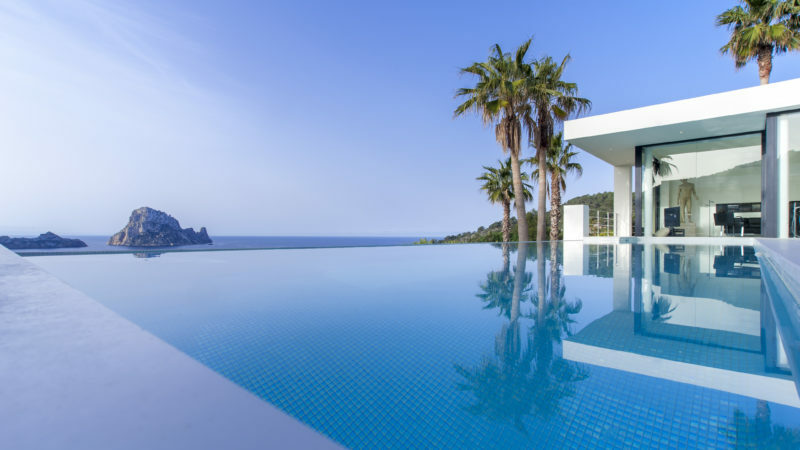 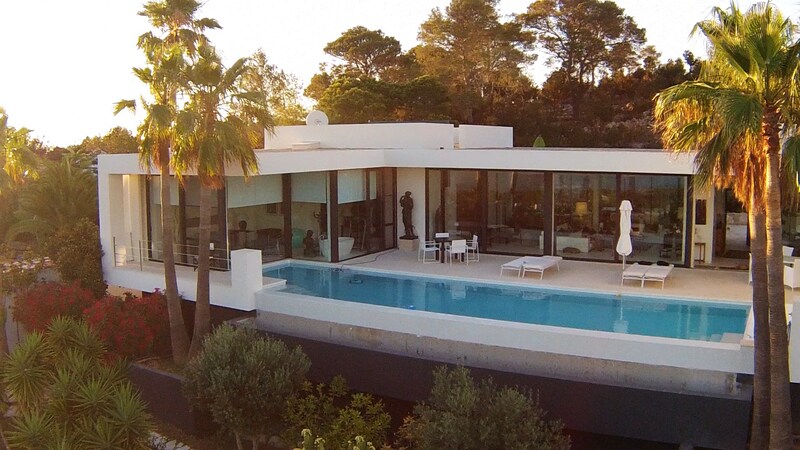 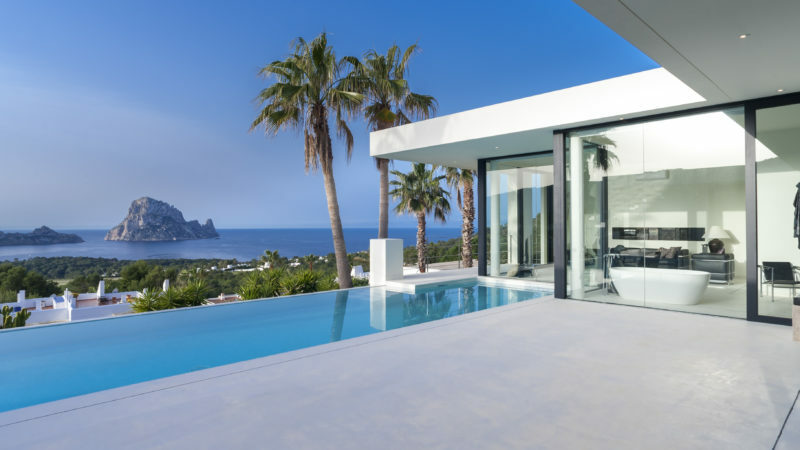 This villa has been remarked for its original and exceptional transparency in 2014 by an international architecture contemporary review who has dedicated to it its cover page, as well as an article on several pages. 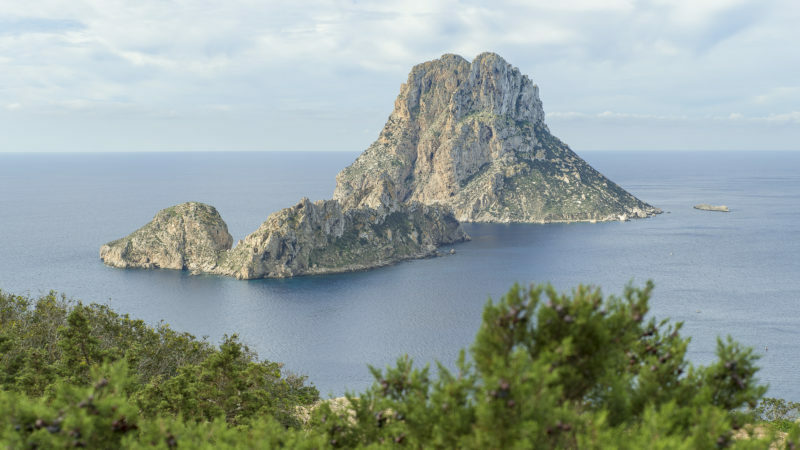 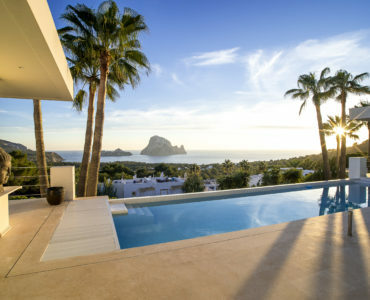 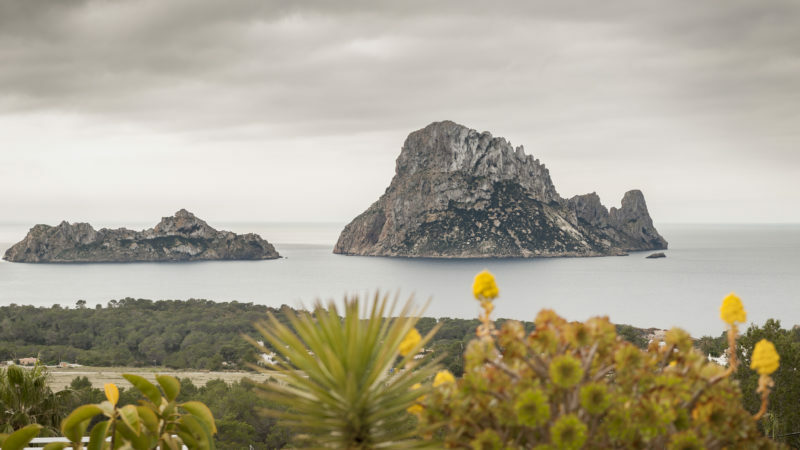 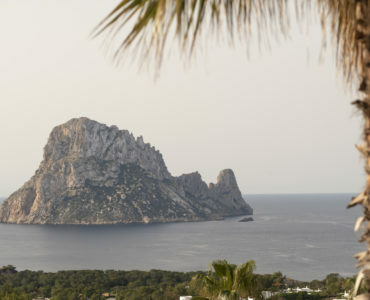 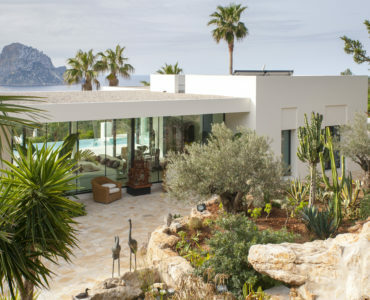 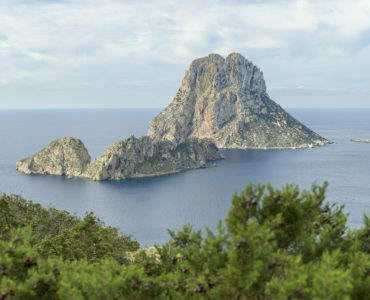 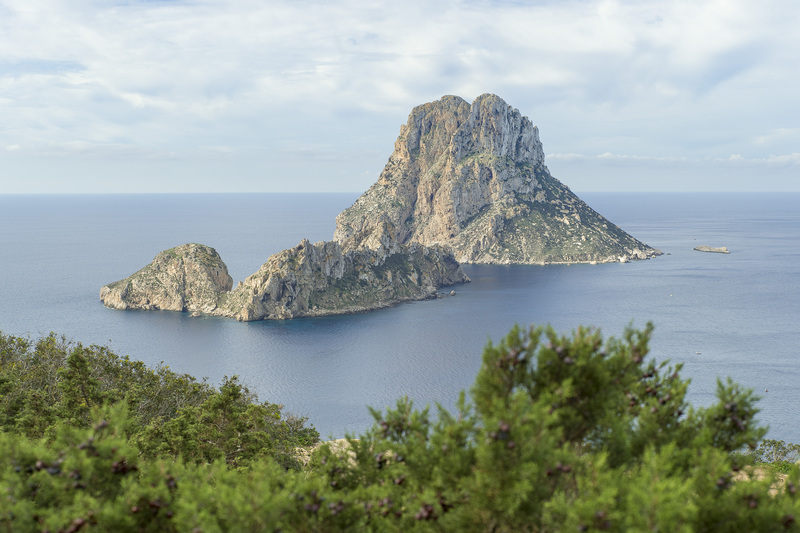 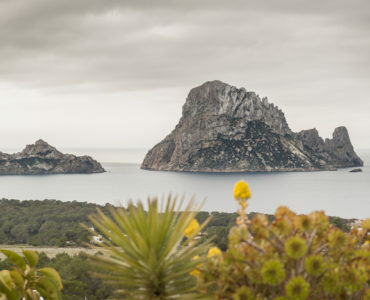 Even the Spanish television made a reportage withing a documentary on Es Vedra and San Jose, the neighbouring villages. 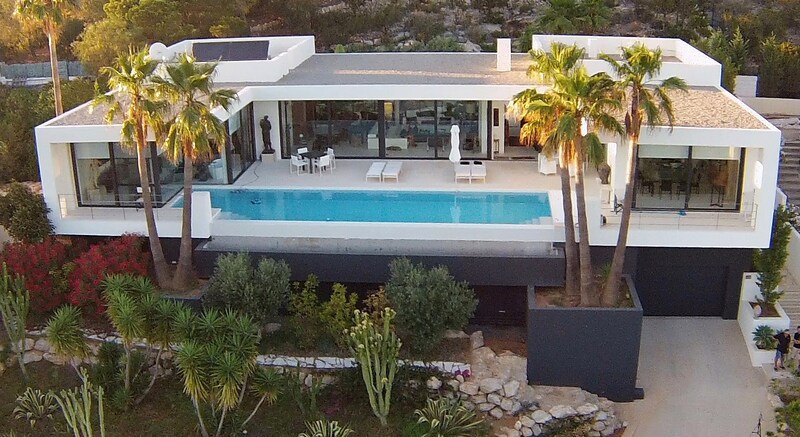 The living and main part of the villa is on one level. 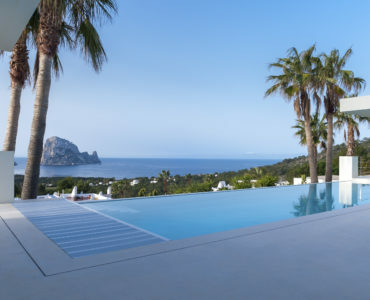 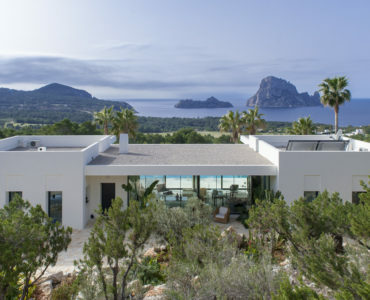 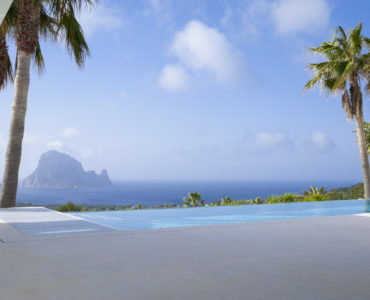 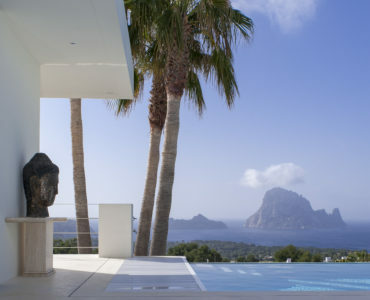 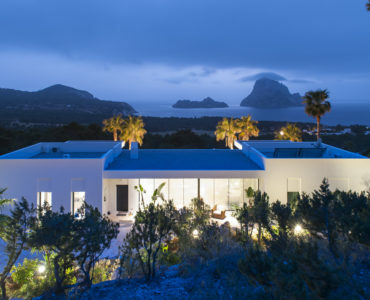 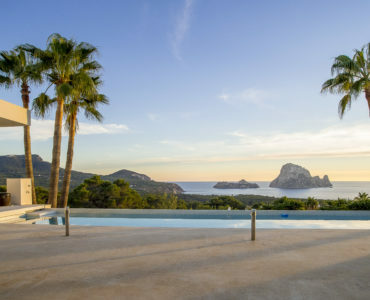 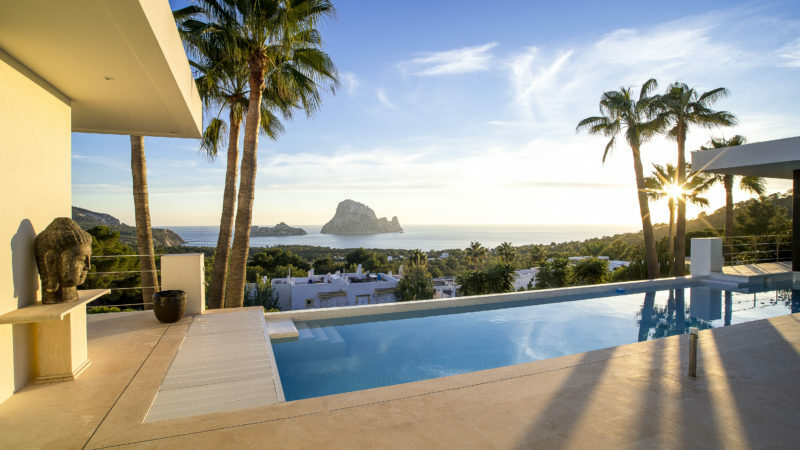 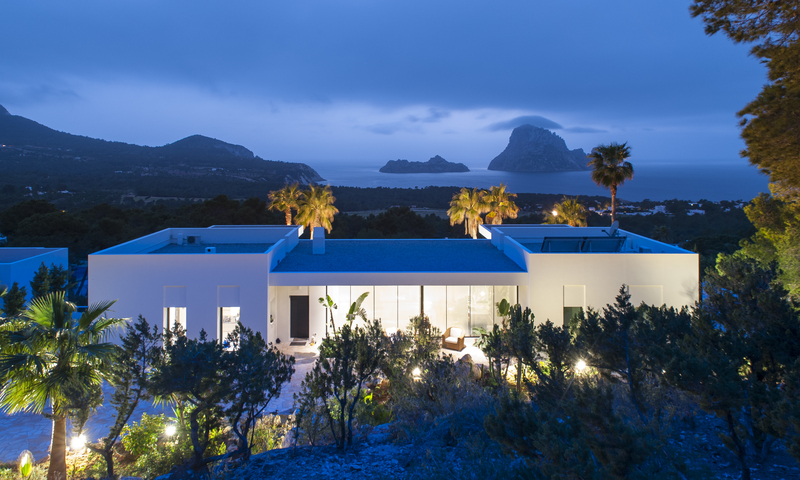 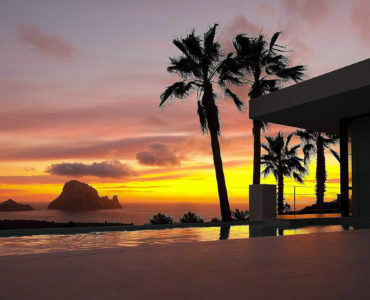 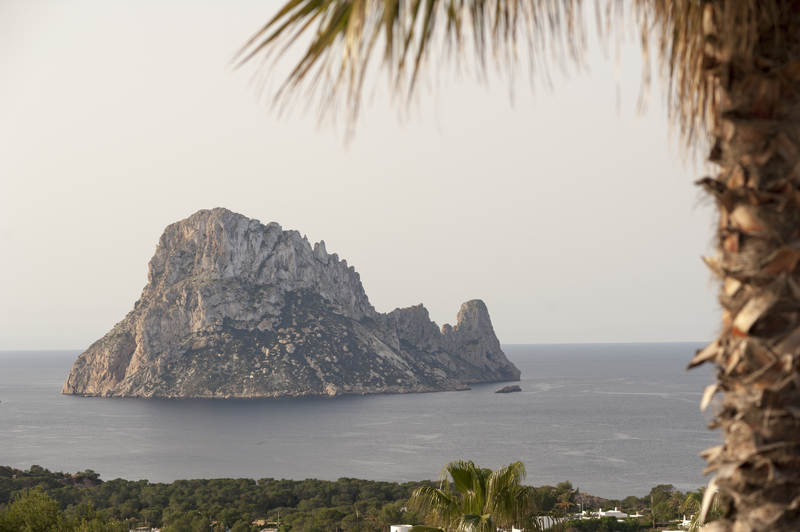 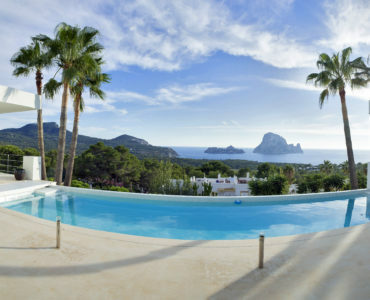 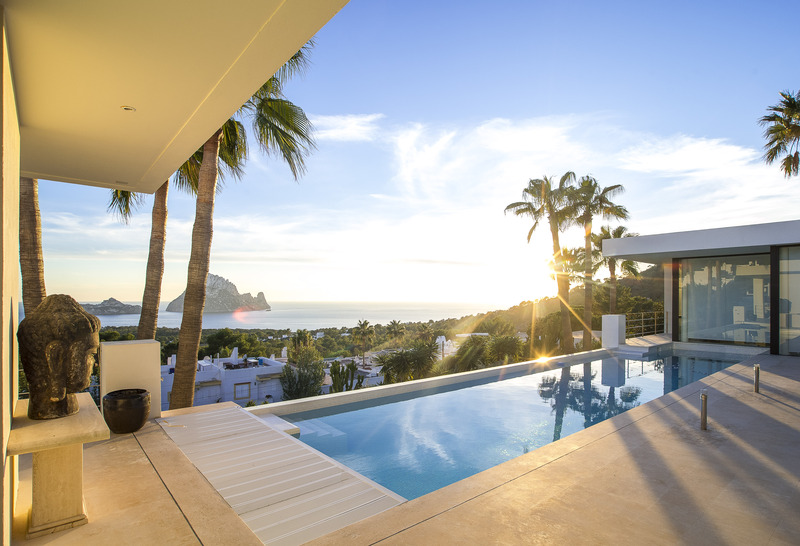 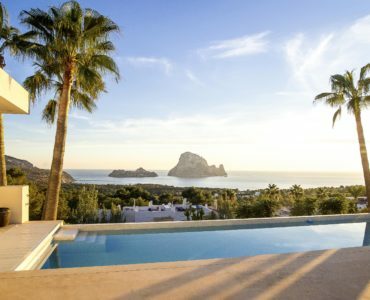 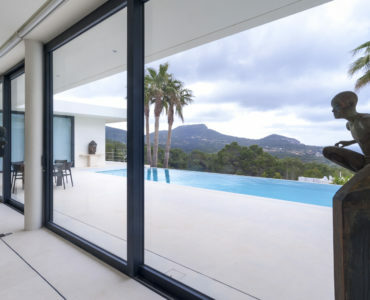 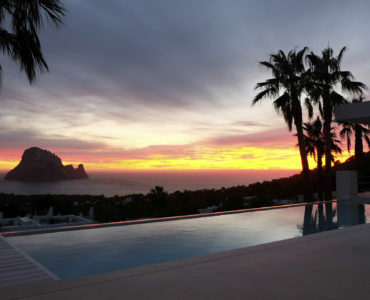 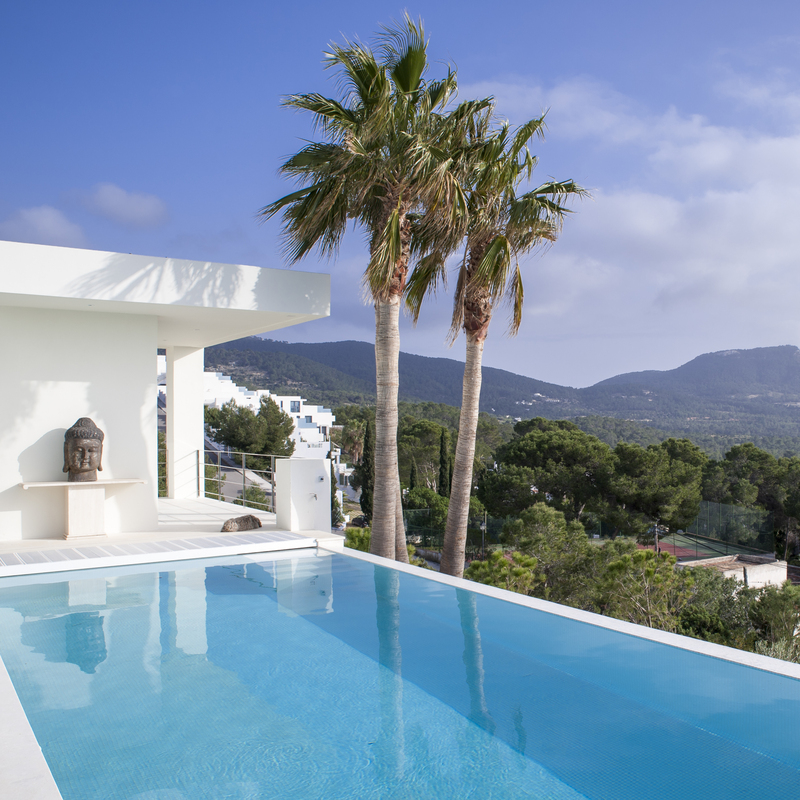 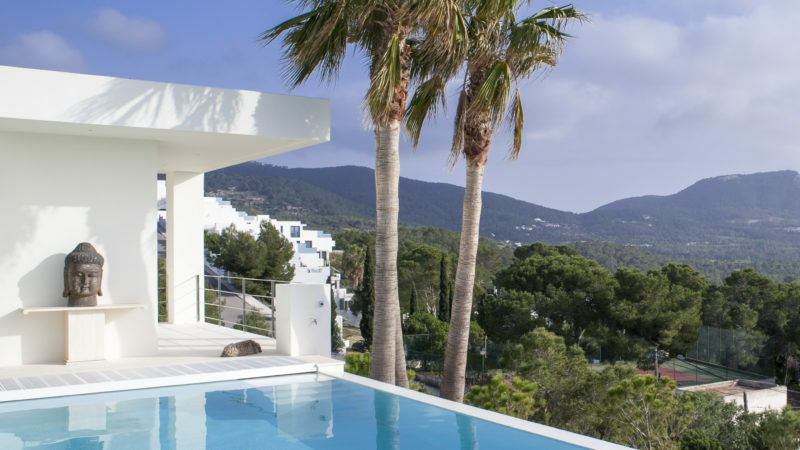 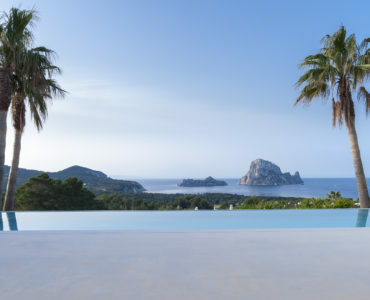 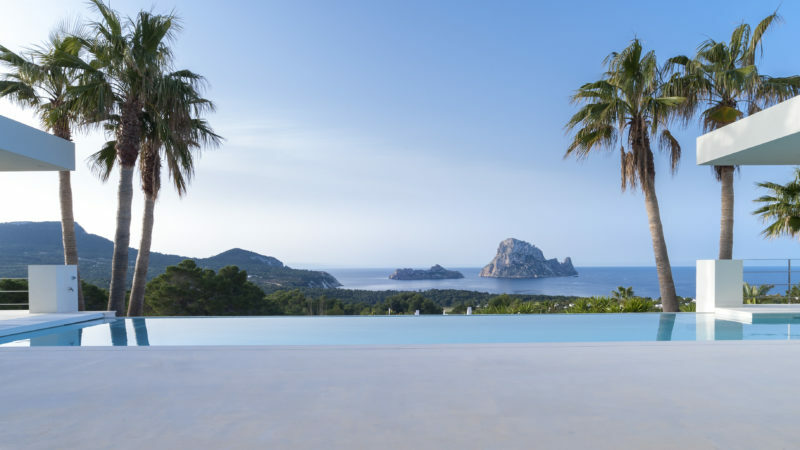 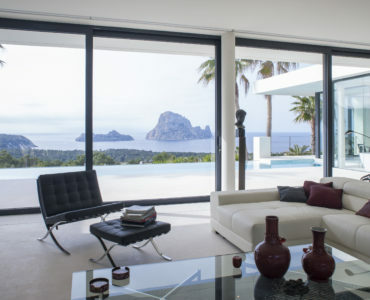 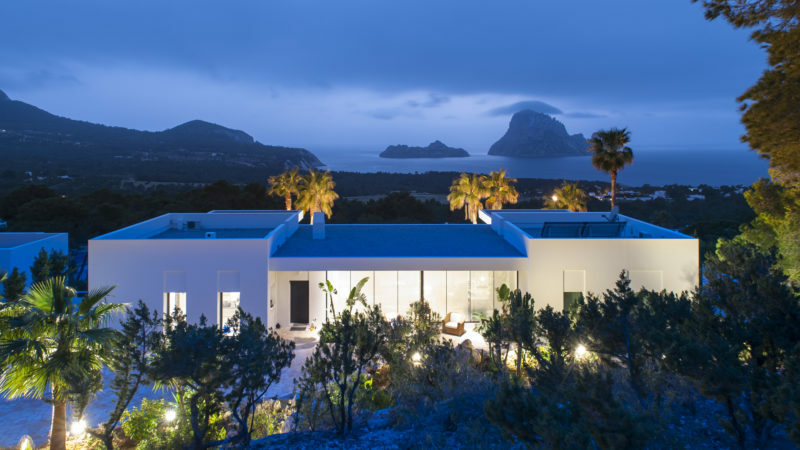 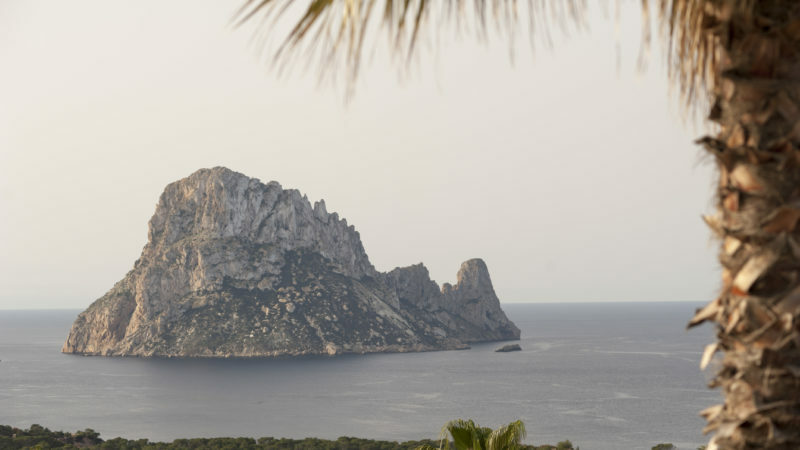 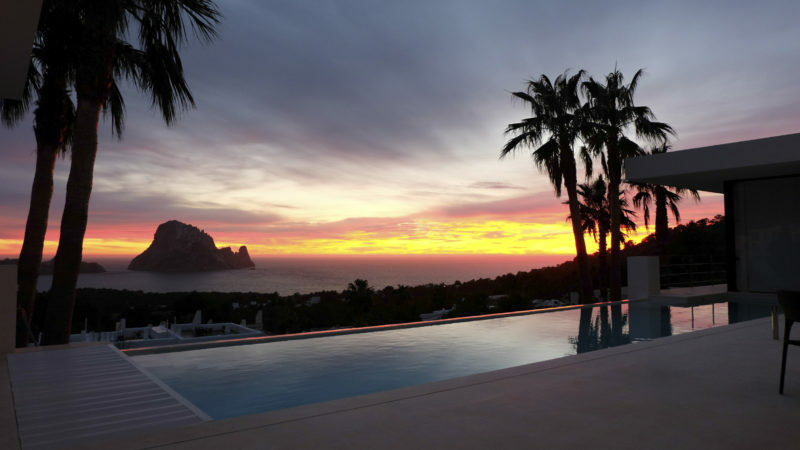 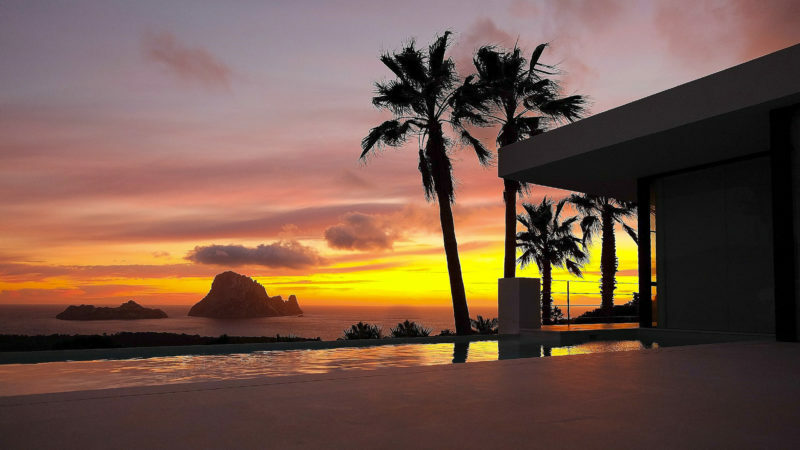 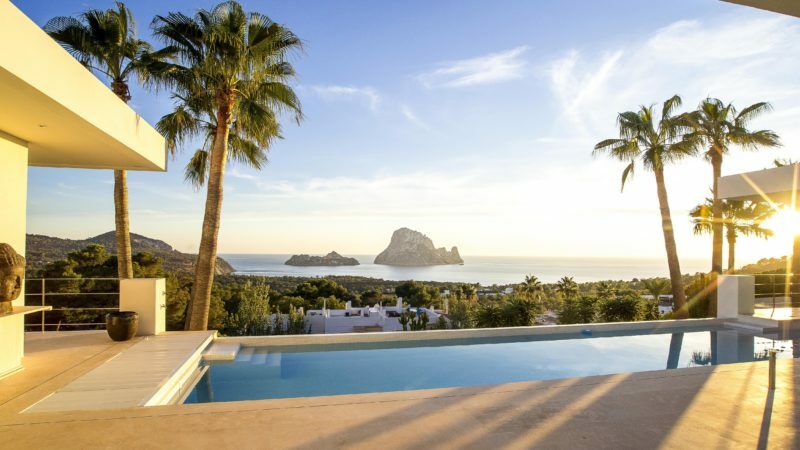 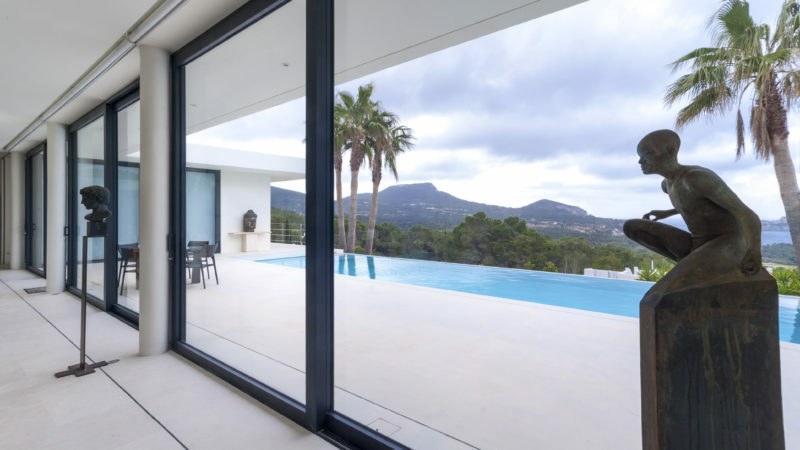 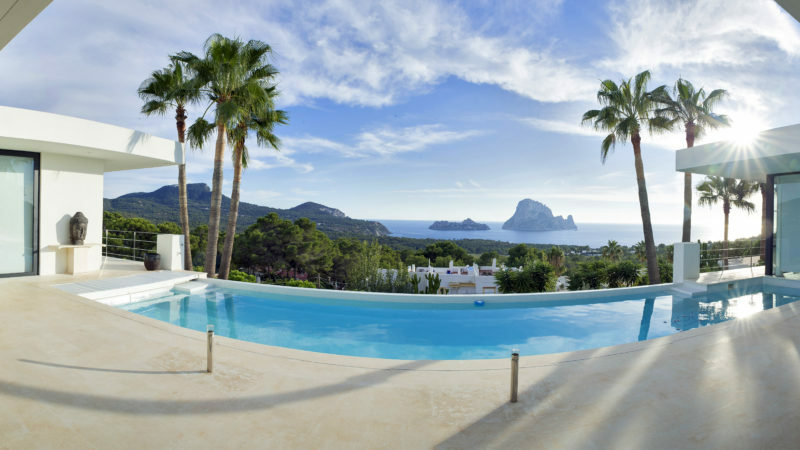 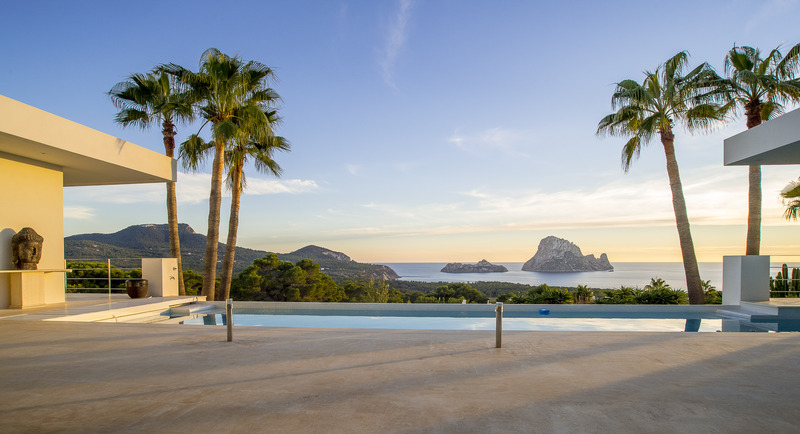 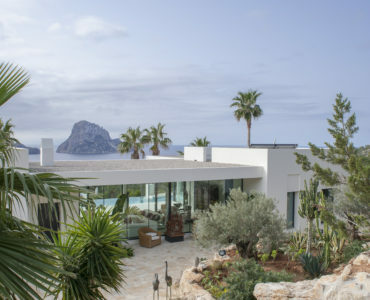 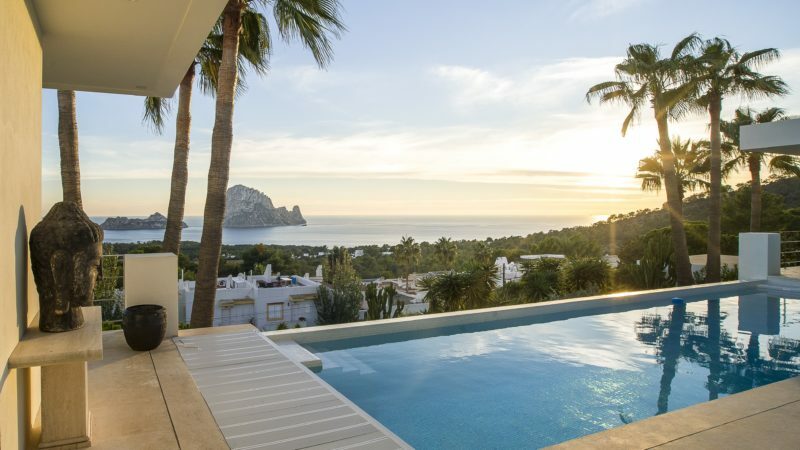 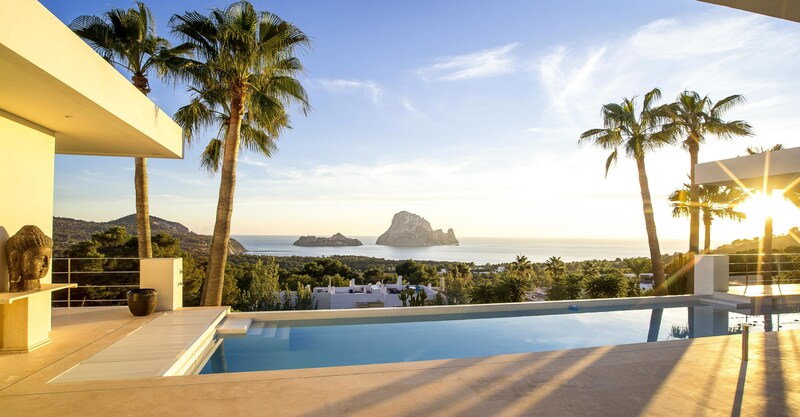 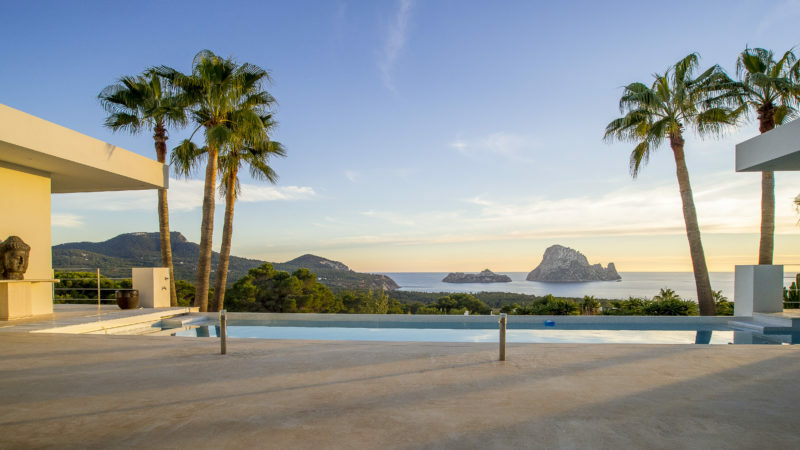 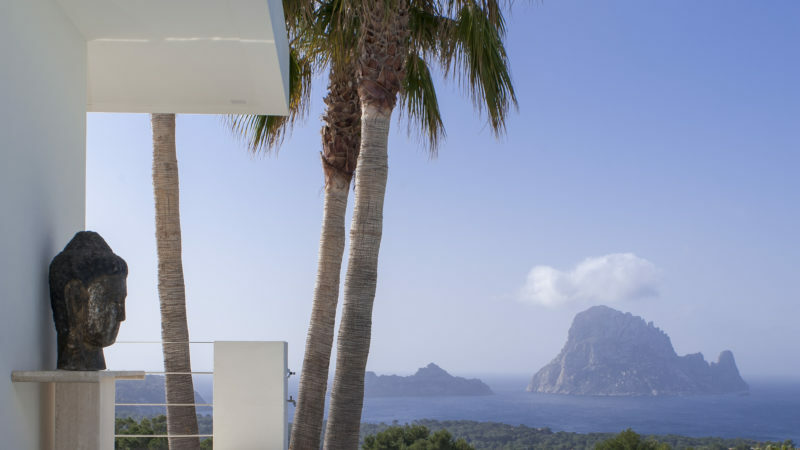 It is connected by a staircase and an elevator, to the below parking space (can accommodate several cars), to depots and technical premises as well as to a small studio apartment with a terrace also overlooking Es Vedra, with a kitchen and a bathroom. 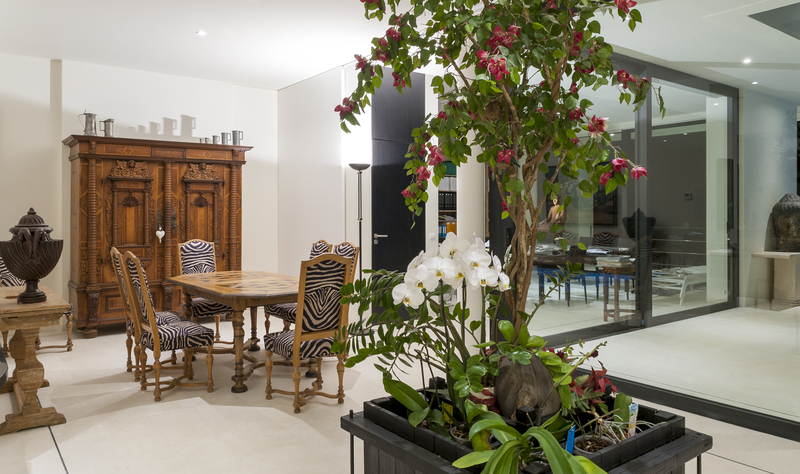 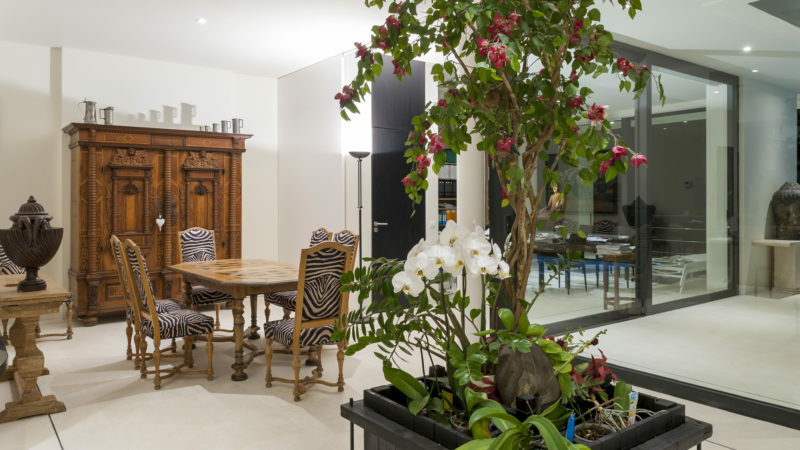 This main living area extends on 340m2 + 65m2, and it includes, a large living room, a contemporary high-end fully equipped kitchen, a dining room, guest toilet and an extensive space in the right wing, which can serve as a second dining room, and easily receive up to 16 people at the table. 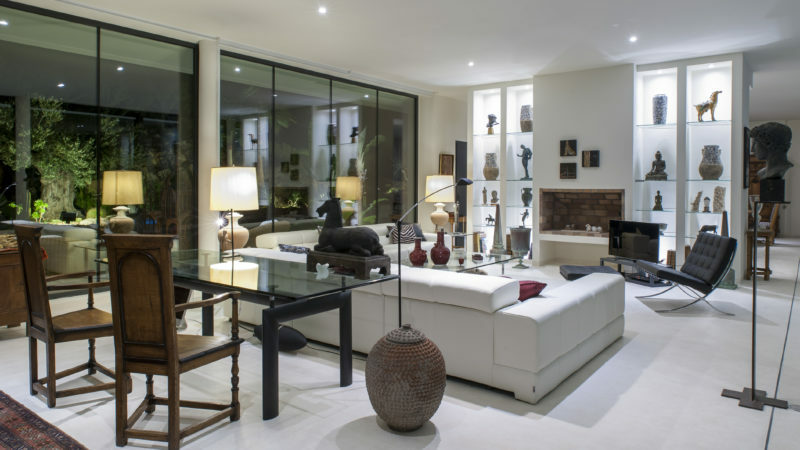 (This piece can also be transformed eventually in a room with an additional bathroom). 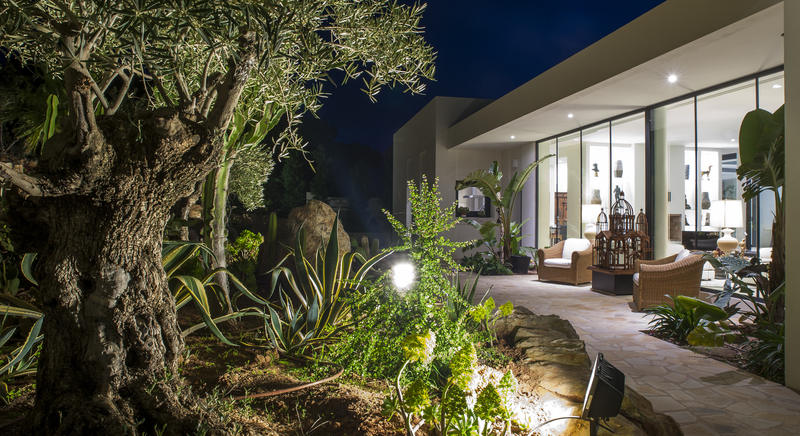 All rooms are sound-proofed, equipped with wifi, home automation system and remote video monitoring alarm. 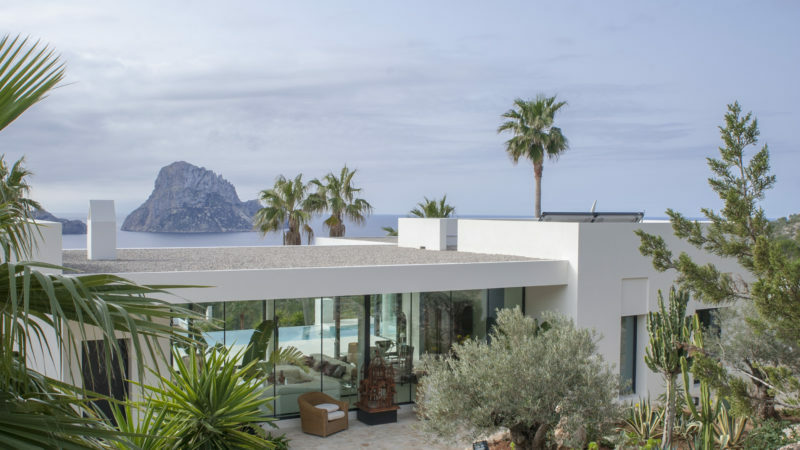 Thee private left wing is composed of a bedroom with a suite lounge and a dressing room, a bathroom with a large Italian shower, complemented by a steam room a great bath for two people overlooking the Vedra. 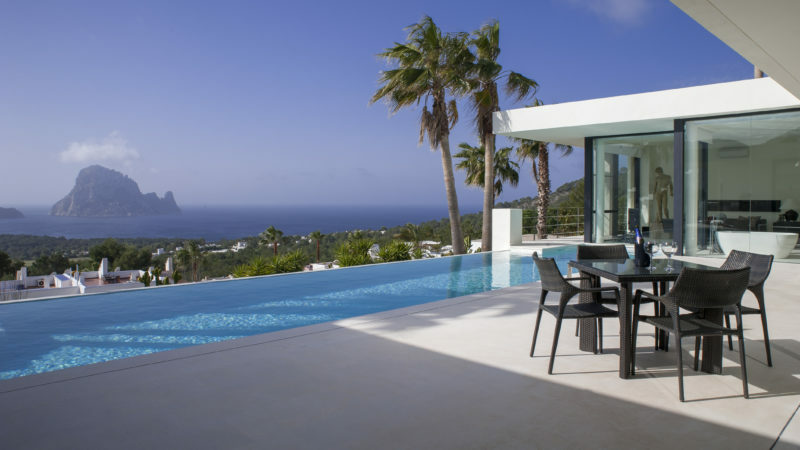 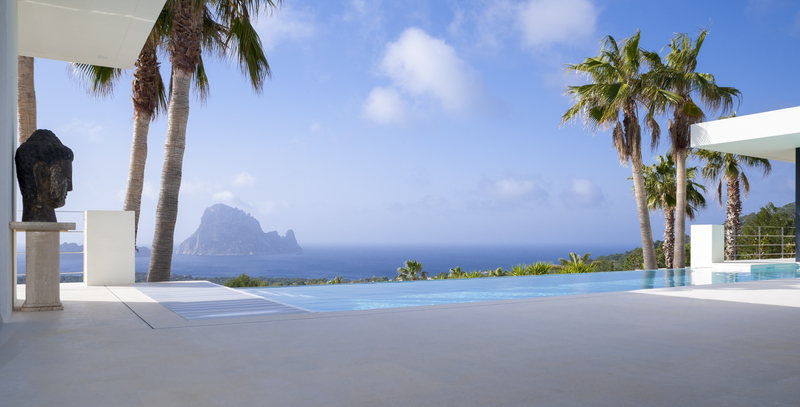 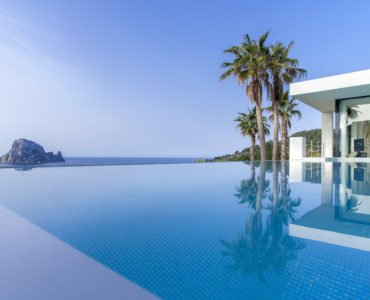 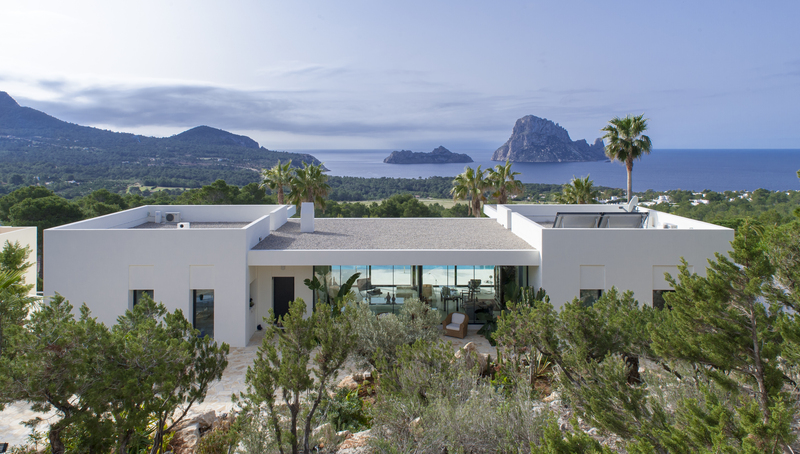 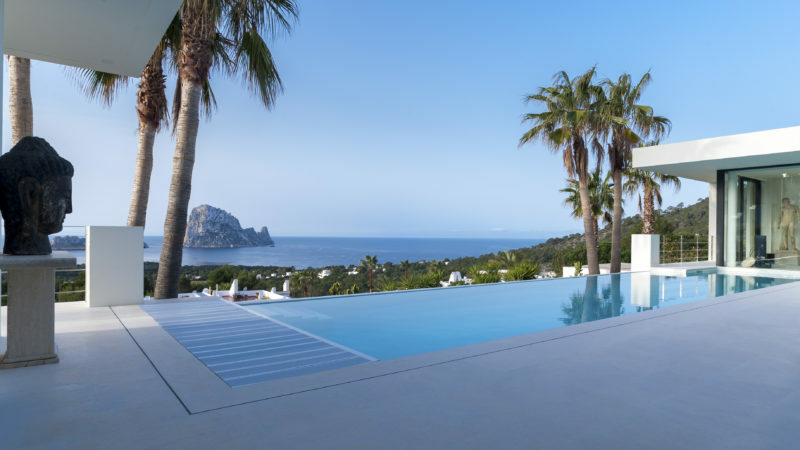 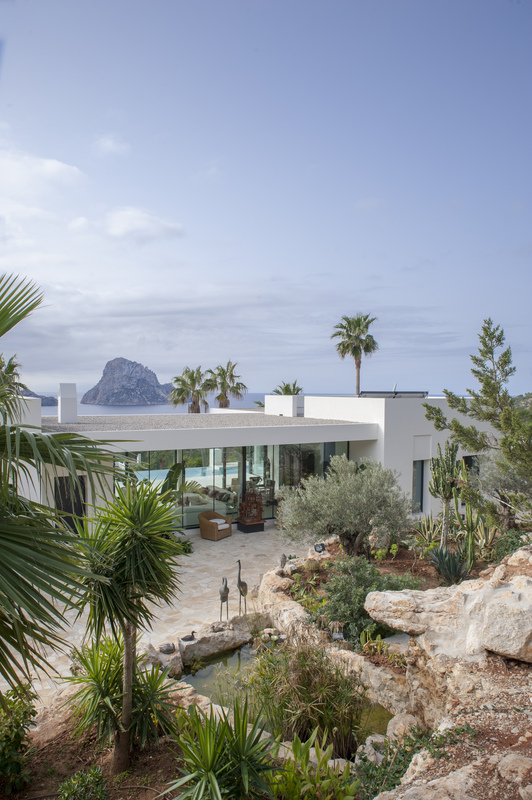 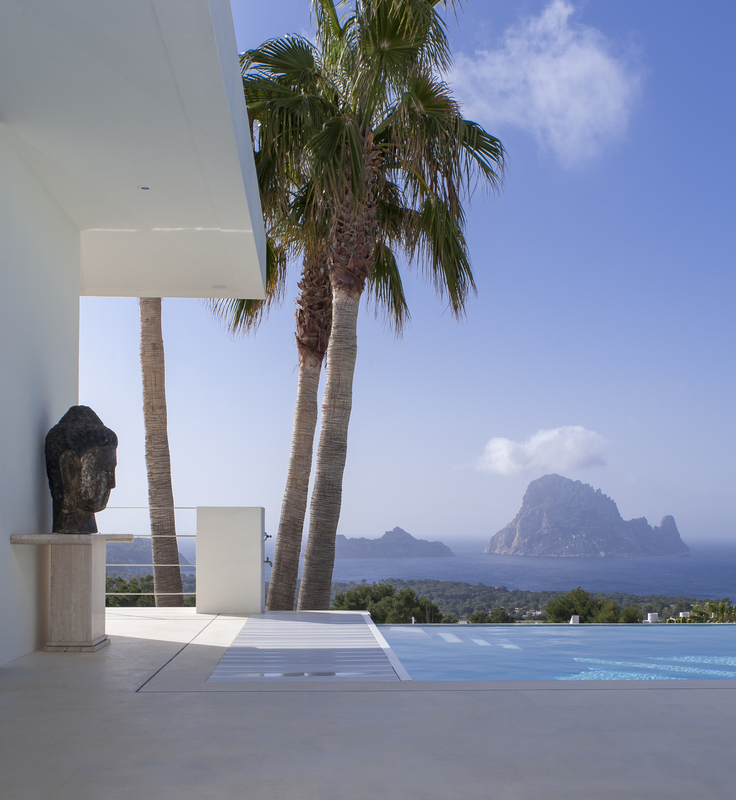 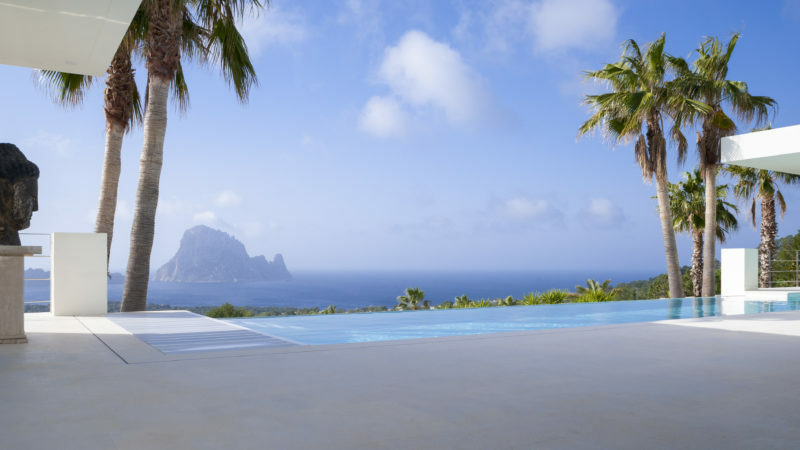 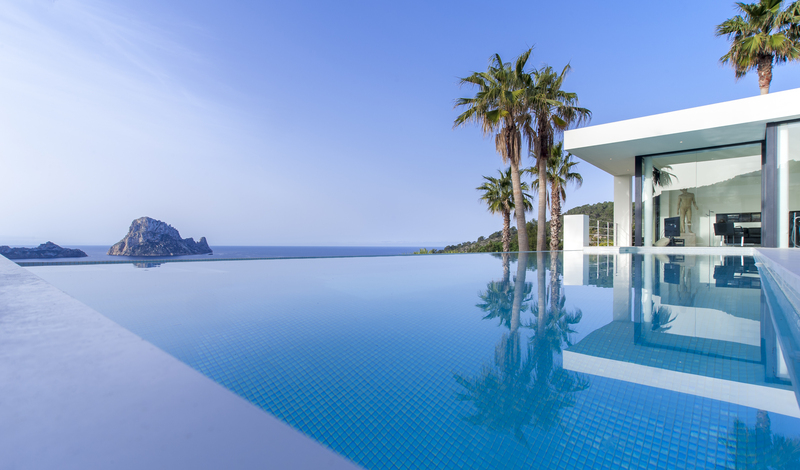 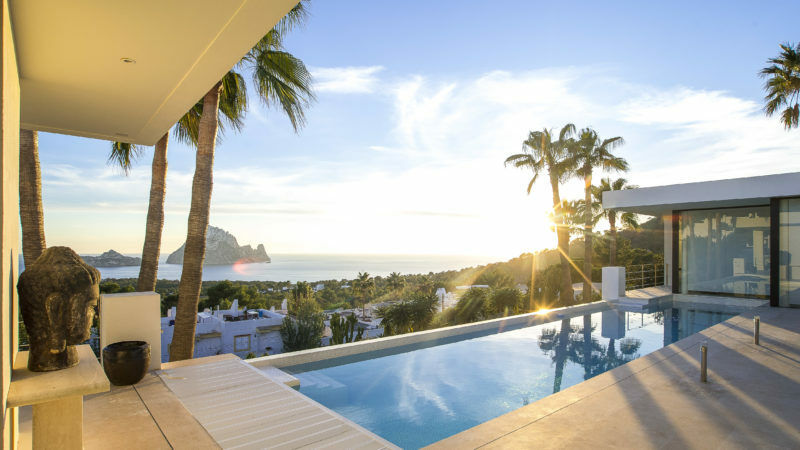 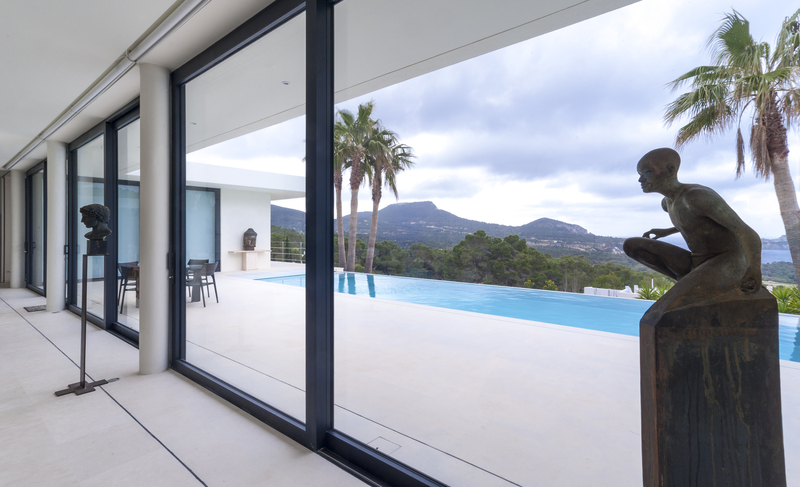 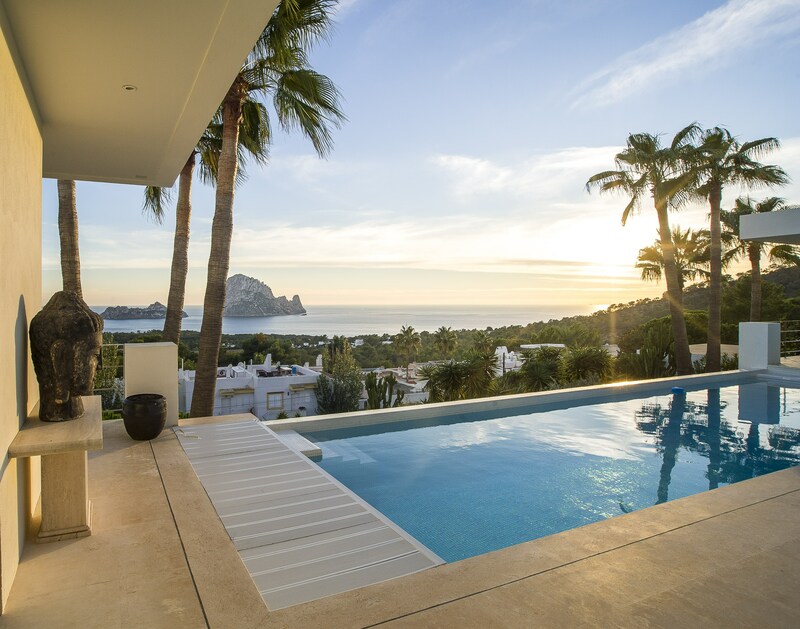 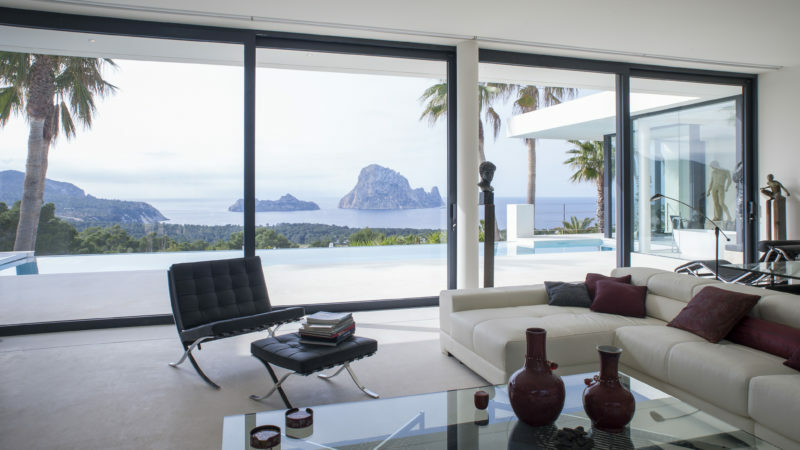 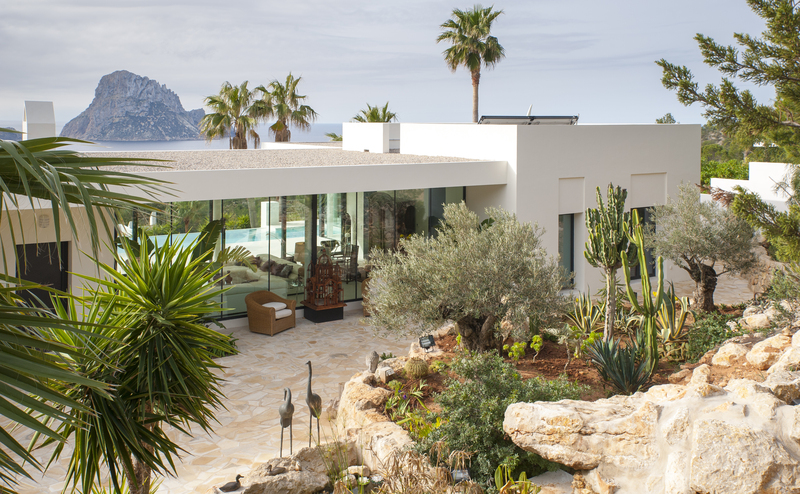 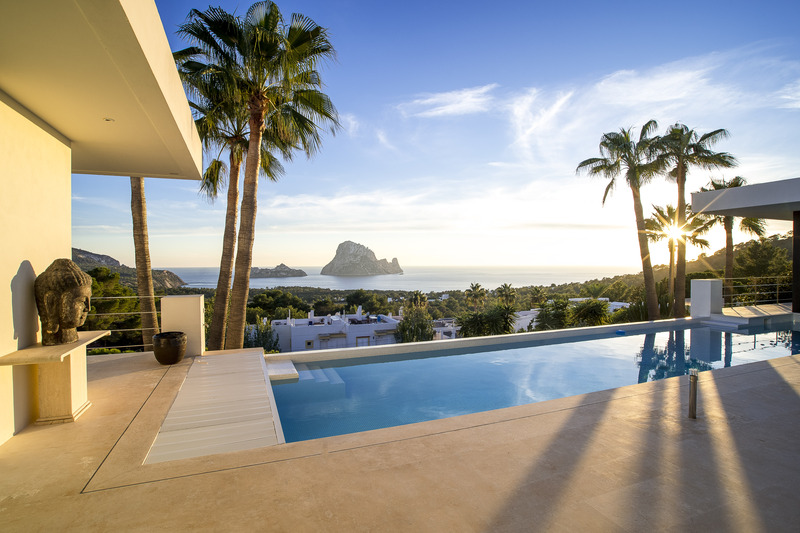 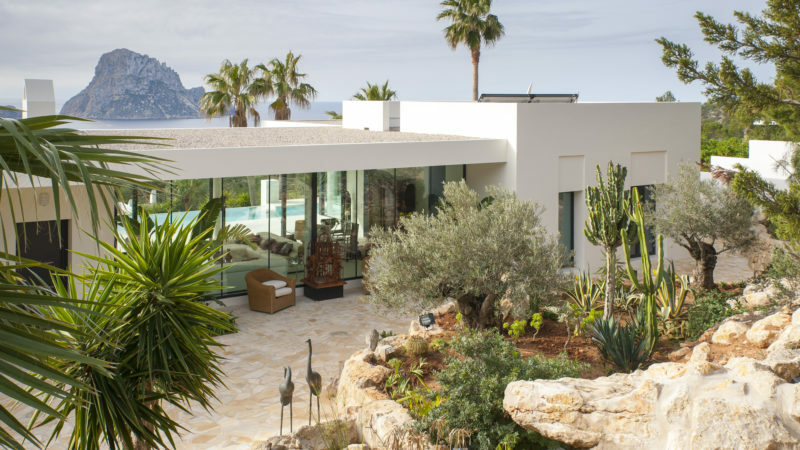 From the living space through transparent sliding doors you can reach the large terrace along the pool, facing the Vedra, with tables and chairs. 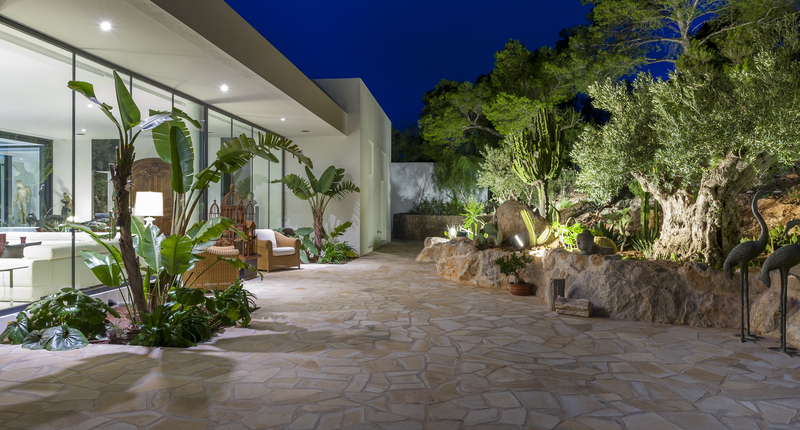 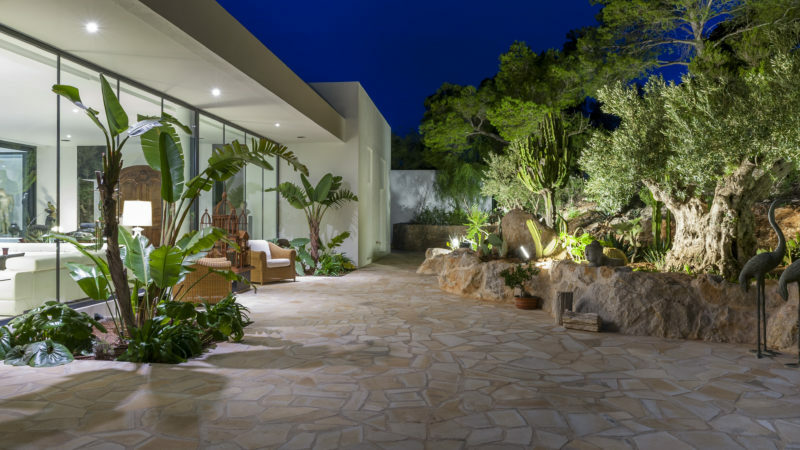 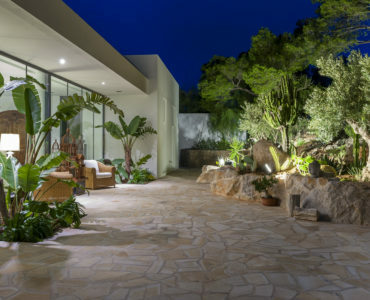 The whole front garden is planted with giant cacti and succulents automatically watered. 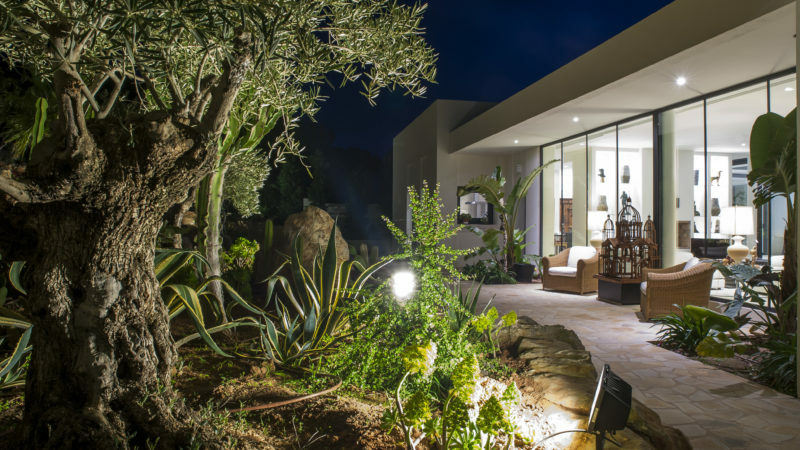 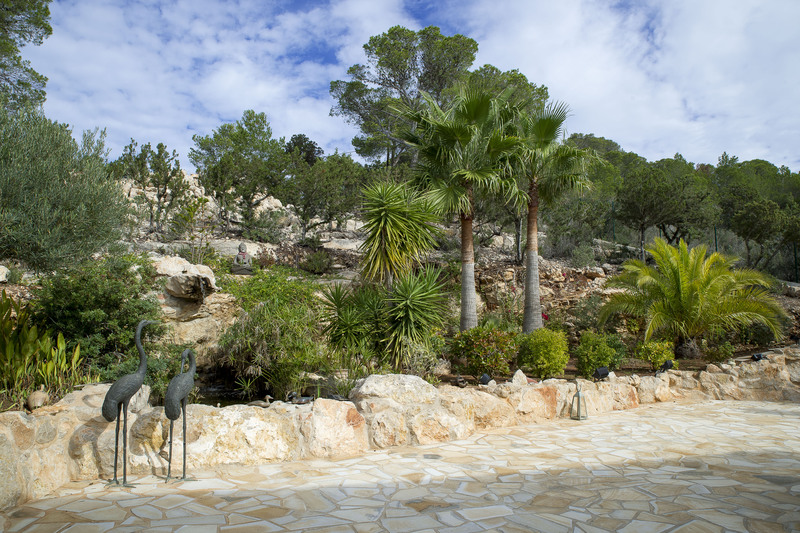 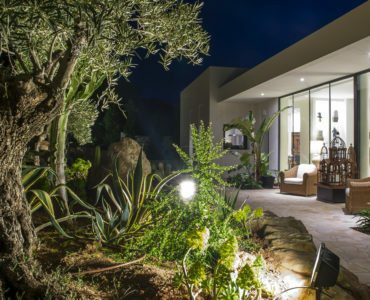 The rear garden fits perfectly with the landscape of the adjoining hill and the natural terrain, with its centenary olive trees, pines and sabines. 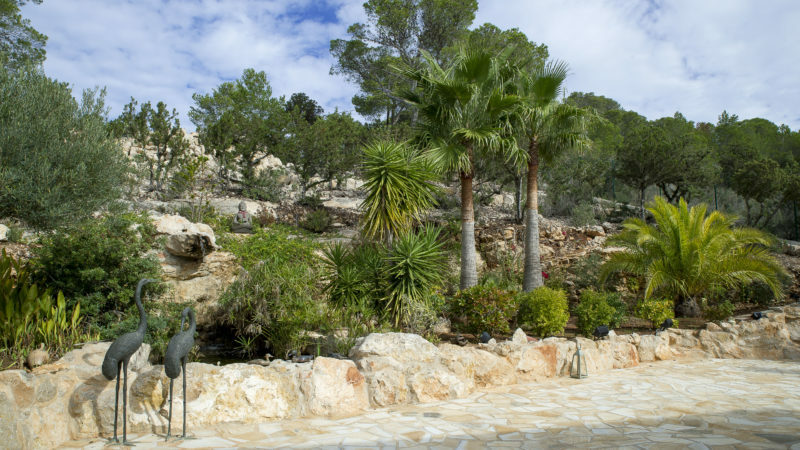 A waterfall flows towards a biotope-treated basin at the bottom. 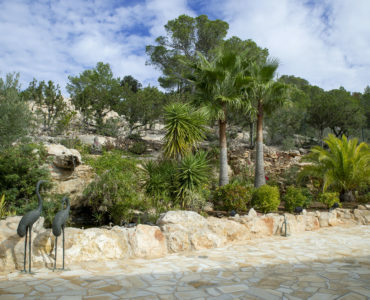 All these gardens are of course lit up at night and give a grandiose and magical view.